Iraqis inspect damage at the site of Tuesday's blast near the Finance Ministry in Baghdad. Baghdad, Iraq (CNN) -- Iraqi Prime Minister Nuri al-Maliki has replaced the commander of Iraqi forces in Baghdad after a string of car bombs killed nearly 130 people, his office announced Wednesday. Lt. Gen. Ahmed Hashim Sultan will replace Lt. Gen. Aboud Qanbar, who has been in charge of security forces in the Iraqi capital since February 2007, al-Maliki's office said. The shakeup followed criticism of the military and police from members of Iraq's parliament over Tuesday's bombings, which left at least 127 dead and wounded more than 400. The bombings targeted two government ministries, a Baghdad courthouse, a commercial district and a neighborhood and were the worst since twin car bombings killed and wounded hundreds of people in late October. Lawmakers called on al-Maliki, Qanbar and other government officials to answer questions about the attacks, which shattered a two-month period of relative calm in the capital. In a statement Tuesday evening, al-Maliki said the attacks were aimed at undermining Iraq's upcoming elections. The country's three-member presidential council set the vote for March 7 after a lengthy impasse in the Council of Representatives, Iraq's parliament, that forced the postponement of the original January date. Among the targets of the attacks was the building that now houses the Finance Ministry, which moved after its old offices were destroyed by a a bombing in August. Bombs also struck the Labor Ministry, a courthouse in Baghdad's Mansour district, the Nahdha commercial district and southern Baghdad's Dora neighborhood. Seven more people died Wednesday in three separate bombings in the city. A bomb planted in a trash can in the northeastern part of city killed two street sweepers and injured seven other people, the Interior Ministry said. 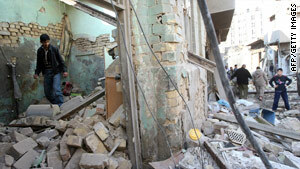 The bomb detonated in the Adhamiya Sunni neighborhood about 8 a.m. local time, while the street sweepers were working. A few hours later, two more people were killed and 11 wounded when a bomb left inside a minibus exploded in the Qahira neighborhood in northern Baghdad. Another bomb exploded inside a minibus Wednesday night, killing three civilians and wounding eight others. The blast occurred around 7 p.m. in the town of Mahmoudiya, about 30 km (19 miles) south of Baghdad.